that exquisite accessories are definitely an important supporting role. but it is the true taste of a person. Calbom Dress Socks can satisfy any of your outfits. and wearing our socks, you are the focus of the crowd. It embodies your fashion attitude and enhances your personality. 75% Combed cotton, 15% Polyster and 10% Spandex. The design socks for men are made of High percentage cotton for awesome comfort and breathability in cotton fashion socks. The crew socks with design and patterned socks are assured to keep your feet odor free, fresh and dry. FASHION PATTERN DESIGN: The Attractive American Flag Pattern Design Will Add A Splash of Fashion Style to Any of Your Casual or Dressier Outfits! It's A Perfect Accessory for You to Wear for Business Events, Weddings, Dating and Any Other Formal And Informal Occasions. Definitely Makes You Someone with Fashion Sense. SIZE: One Size Fits Most. 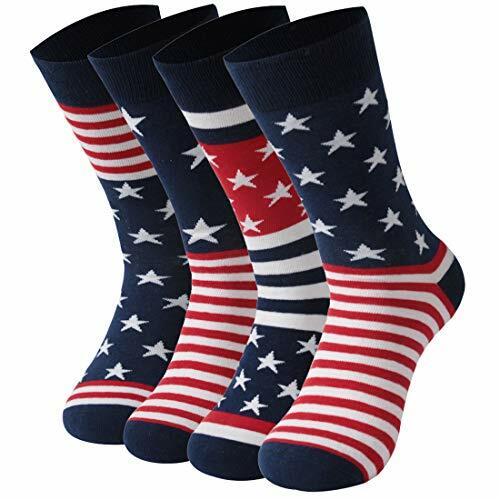 Our American Flag Dress Suit Groomsmen Wedding Socks Come in One Size That Fits US Men's Sock Size 10-13(Shoe Size 6-14). Mid Calf Length with Elastic Tubes and Cuffs Make Sure the Socks Stay in Place without Sliding Down During Movement. BEST GIFT CHOICE : CALBOM Gentleman Fashion Stars Patterned Funky Long Cotton Crew Socks, A MUST-HAVE Item in Your Wardrobe and Great Gift Choice for Independence Day, Thanksgiving Day, Birthday, Wedding, Anniversary, and Other Holidays! Luxury Gifts for Man, Father, Son, and Your Lover! WHAT'S INCLUDE: We Have Different Variations for You to Choose! 2/4/6 Pairs Pack with Different Fashion Stars Patterns Makes Your Day Different! SATISFACTION GUARANTEED: COLBOM Socks come with 100% MONEY BACK GUARANTEE! If You are Not Satisfied with Our Socks, Just Return It to Us Within 30 DAYS for A Risk-Free Full Refund! Feel Free to Contact Us Via Email for Any Problem at Anytime. We Will Get Back to You Within 24 HOURS and Try Our Best to Deliver A Timely Solution. DON'T HESITATE and ORDER NOW! If you have any questions about this product by Calbom, contact us by completing and submitting the form below. If you are looking for a specif part number, please include it with your message.